Caviar Delivery Reviews: Ideal Food Delivery Service for You? Owned by Square Inc., Caviar Delivery provides customers with quick and easy access to popular local restaurants, who can place orders for delivery or pickup, whether immediately or up to seven days in advance. Caviar Delivery Review: Ideal Food Delivery Service for You? Caviar Delivery promises to offer diners an easy way of ordering food from the best local restaurants in 26 cities across the U.S.
Customers can place orders for immediate delivery or schedule them in advance, and can even pick up their food directly from the restaurant to avoid delivery fees altogether. Caviar for Teams also allows businesses to place large group orders and obtain catering, all of which is billed directly to a corporate account. But, just because Caviar promises to provide quick, reliable delivery or pick up from wherever you are, does this mean they deliver on this promise? Are there other companies that might be a better fit, based on your unique needs? Over the course of this review, we’ll deliver all the information you need to make a more empowered decision. Boston, MA; Brooklyn & Queens, NY; Chicago, IL; Dallas, Texas; Fort Worth, Texas; Greater Philadelphia, PA; Knoxville, TN; Los Angeles, CA; Manhattan, NY; Marin County, CA; Northern Virginia, VA; Orange County, CA; Peninsula, CA; Philadelphia, PA; Portland, OR; Richmond, VA; Rockville, MD; SF: East Bay, CA; Sacramento, CA; San Diego, CA; San Francisco, CA; Seattle, WA; Seattle Eastside, WA; Walnut Creek, CA; Washington DC Metro, DC; Woodbridge, VA.
To order food in one of these areas, you’ll start by entering your address, clicking the Find Food button, and the scrolling down to view restaurants in your area that are currently open and accepting orders. You can filter these results by pickup or delivery, when you need it (ASAP or Scheduled for Later), and by a specific address or using your current location via GPS. According to the Caviar website, their system doesn’t recognize addresses for in-law apartments, so keep this in mind depending on your living situation. On the other hand, if you select Scheduled (the company strongly recommends booking this at least 24 hours ahead of time), you can choose your pickup or delivery date and time window from a drop-down menu at the top of the page, up to seven days in advance. Clicking on a restaurant’s photo allows you to browse through their menu items, while another click adds items to your cart. You can add special instructions at this time for each item, or by editing an item during check out. It’s also possible to leave special instructions for the entire order before completing your purchase, as well as for the delivery driver. Pro tip: Keep in mind that any special instructions might constitute an additional charge, based on the restaurant’s pricing. You can check out whenever you’re ready by tapping the shopping bag icon in the upper right-hand corner of the page and entering your payment details. This will automatically create an account and save your information for future orders. After tapping the Place Order button, you’ll redirect to a confirmation page where you’ll find a GPS tracker for keeping tabs on your food, as well as an itemized receipt for your records. Once the restaurant confirms the order, or when it’s ready for pickup or has gone out for delivery, this page will update accordingly. If you’re not there when your courier arrives (depending on your instructions), they’ll reach out to you via text or email and wait for 10 minutes. Afterward, your order will be forfeited. Similarly, pick-up orders are forfeited 10 minutes past their scheduled time. You’re not required to tip your courier, although it’s always appreciated if they did a good job. Tips are available between $0 and $5 for iOS users ($0 to $3 on Android), which you can add directly in the Caviar app up to two hours after your food is delivered. What Is Caviar for Teams? By signing up for a Caviar for Teams account, they advertise that your company can enjoy easy group orders. This includes choosing a restaurant and allowing your team to select their menu items using a special link, setting spending limits, paying via a corporate account, and catering groups of 10 to 200+. Caviar for Teams also integrates with Slack so that you can send restaurant options and order updates directly to employees. Additional features include auto-checkout functionality, advanced search and filters, and extensive account management and support. Still, some restaurants may choose to increase certain menu items to cover the cost of fees (such as staff fees, bag fees, related restaurant fees, etc.) so keep this in mind. Furthermore, each restaurant sets a minimum subtotal for delivery orders, which could increase during periods of unusually high demand. Caviar also charges a delivery fee that will vary depending on the business, “based on travel time from the restaurant and other costs associated with each restaurant partner,” we’re told. An additional 18% service fee is also included with each order. None of these fees apply if you place an order for pickup. Need to cancel? This isn’t possible if your meal is already in production, and no refunds are available. They’re also not available if your courier has to wait more than 10 minutes and is assigned to their next order. Among nearly 9,000 combined reviews between iTunes and Google Play, the Caviar app held an average rating of about 4.4 stars. Most compliments cited ease of use, great restaurant selection, fast delivery, and reasonable prices and fees, while complaints commonly referenced limited restaurant availability, high prices and fees, delivery issues (long delays, incorrect orders, etc. ), and functionality issues. A company representative responded directly to many of these in an effort to find a solution. While many restaurants certainly offer their own pickup and delivery services, and there are a handful of smaller players in the marketplace, there are currently four other main competitors with Caviar Delivery: Uber Eats, Postmates, Grubhub, and DoorDash. And when it comes down to it, these services have more core criteria in common than otherwise, including website and app accessibility, hyper-local restaurant availability, the ability to place immediate or advance orders, and they all charge a variety of associated fees for the convenience. As such, the biggest differences are which restaurants you’ll have access to, and how much you’ll pay to order from them. For example, Caviar’s restaurant-initiated delivery fee on all orders, on top of their flat 18% service fee, makes them one of the most expensive options we’ve written about so far. Uber Eats’ booking fees are right up there as well, which can reach $20 depending on how business the platform or restaurant is. However, Uber Eats also provides access to restaurants in more than 50 cities across 13 countries, whereas Caviar currently services 26 U.S. cities and metro regions. Caviar for Teams is unique among the competition, though, which seems like it could greatly streamline workplace ordering, if this is something you might need. If widespread availability is one of your main factors, Grubhub connects 85,000+ restaurants in 1,600+ U.S. cities, while DoorDash serves more than 600 U.S. cities and 110K restaurants. Grubhub also doesn't charge for their services, and fees are only in place if assessed by each restaurant. How can you pull all of these details together and make the best decision? Let’s address this important question as we wrap everything up. As you might imagine, when it comes to the ‘best’ online food delivery service, it’s all about you. In other words, it’s ultimately going to come down to which options offer the food you want, at the time you want it, and at a price you think is fair to pay. With these details as our foundation, it also seems that, based on the extensive user feedback for the app on iTunes and Google Play, most people who order from Caviar Delivery are pleased with their experience. And if you’re one of the few who doesn’t, the company stands behind their services with a seven-day refund policy. My office has been using Caviar for 8 days and so far we have received over $200.00 in credits because of the constant mistakes (late, no shows, missing items). It has become a second job managing Caviar mistakes. Currently looking for another company. My wife and I run businesses so cooking dinner does not happen often. So when Caviar came along, it was a godsend that added more variety to our takeout. We order through Caviar, 1-2 times a week and the orders are 50% accurate. We always order extra stuff to try and outguess what we'll get! 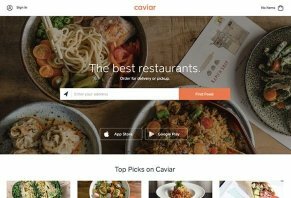 Write a Review for Caviar Delivery!